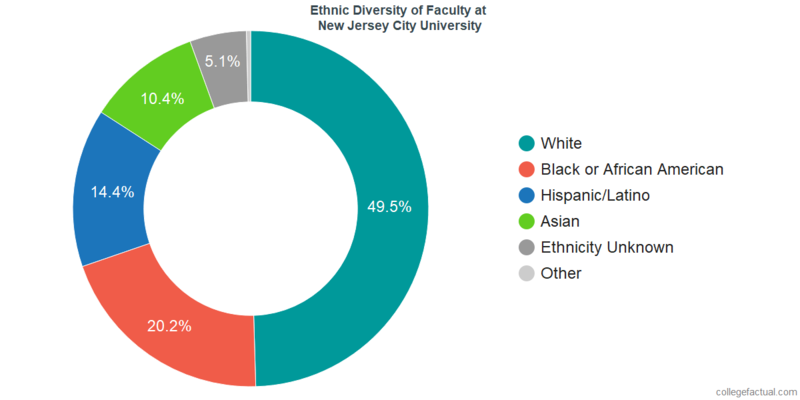 NJCU Demographics: How diverse is it? Start now by Learning About Diversity at NJCU, and how it is Similar to Other Schools in the United States. The overall diversity ranking is created by adding up individual factors of ethnic, geographic, age and gender diversity. New Jersey City University is thought to be above average in overall diversity, and is ranked #936 nationwide. Many students value the chance to meet and learn from different ethnic and racial groups, which is more likely to happen at a diverse school such as this one. New Jersey City University is ranked #117 in ethnic diversity nationwide with a student body composition that is far above the national average. If available, the chart below will display ethnic diversity among the undergraduate students at NJCU. NJCU boasts excellent ethnic diversity. At New Jersey City University, the disparity between men and women on campus is on par with the national average. The undergraduate student body at NJCU is equally balanced. This university is ranked at #1,172 in male to female diversity nationwide. The undergraduate population is comprised of 2,708 males and 3,955 females. If available, the chart below will include the male to female percentage among NJCU's undergraduate students. The disparity between the counts of men and women at New Jersey City University is on par with the national average. If available, the chart below will include the male to female percentage among NJCU's faculty. The ratio of male to female faculty at NJCU is excellent. Do you want a local school that attracts local students? This could be a good choice for you. We've derived the location diversity of each school by looking at where undergraduates lived before they were admitted. Over 90% of the students attending New Jersey City University come from within New Jersey. This puts NJCU's level of geographic diversity below the national average and gives it a national geographic diversity ranking of #1,844. The undergraduate student body is split among 11 states (may include Washington D.C.), as shown in the chart below. There is a relatively small community of about 129 international students at New Jersey City University representing 21 countries. For all the details, go to the NJCU International Student Page. Would you prefer a school where the student body represents a blend of different ages and generations, or would you rather have a school where most students are the same age as you? The "traditional" college student is thought to be between the ages of 18-21. However, this university appears to attract a majority of older students. At New Jersey City University, 27.7% of students are in the age 18 to 21 bracket, compared to the national average of 60%. We rank NJCU #364 in the nation for student age diversity. Analyze the age distribution of NJCU students with the following chart. Often when we speak of diversity, which is simply defined as "variety", what we mean is multiculturalism, or the acceptance of people of different ethnicities, races, cultures, beliefs and economic backgrounds. When most students seek diversity on campus, what they are actually seeking are opportunities to express themselves and find community with others who believe the same way, as well as opportunities to learn from those from different cultures and backgrounds. Is NJCU supporting learners from all income backgrounds? Schools with otherwise excellent ethnic and location diversity still may not be diverse when it comes to other factors, such as financial backgrounds. Get a better idea of how NJCU supports low-income students by visiting the Financial Aid Page. 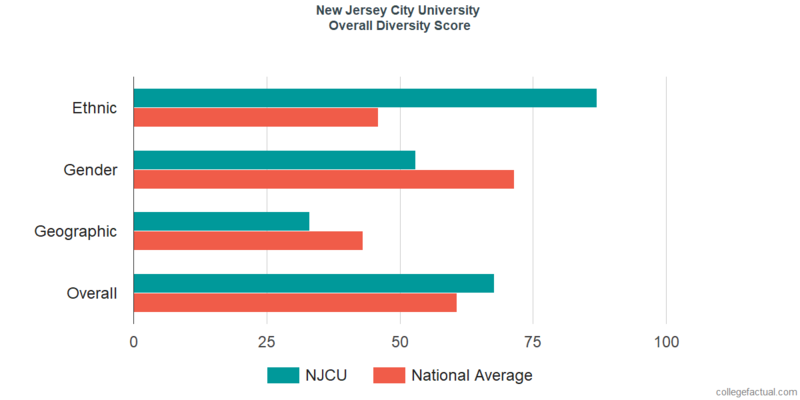 How important is diversity to NJCU?